I'm from Wayne, Oklahoma. I know a lot of people go around bragging they're from Wayne, Oklahoma, but I really am. Wayne is a small Oklahoma town founded by rail workers building the railroad that cut through central Oklahoma. From the house my folks built in the countryside I could hear the lonesome whistle of engines as they made their way through town, never stopping except to allow another train to pass. 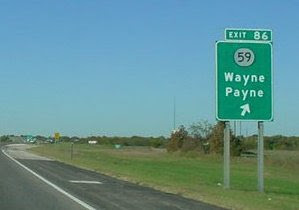 As the heyday of rail lines passed, and after the north-south venue of Highway 77 was replaced by the new interstate, the town became more known for its signage on I-35, the "Wayne-Payne" exit (the "Twin-Cities of Oklahoma" as I've referred to it in countless speeches). Wayne is largely an agricultural community still steeped in rural traditions and culture. I've heard people describe their own small towns as having only one stop light. Mine still has none. Thirty years have passed since my own classmates and I--as many of our own parents and grandparents did in the generations previous--participated in the commencement of Wayne High School. Little has changed in physical appearance except for a few buildings that are no longer there, and according to the census, the addition of about 200 new residents since 1980. Some of my own impressions of Wayne have changed but others have been reinforced during several recent visits. Living out of state for many years, my visits home have been few and far between. Having returned to the state however, I have had the opportunity to visit my home town four times. The first was for a high school football game on "Alumni Night," then to speak at the 2010 Commencement. My third trip was just passing through as a part of a funeral procession for my step brother Mike Millsap. My latest visit was for the all-class reunion of Wayne High School, a five-year event that brings together all available alumni from all classes--another uniquely small town opportunity that brings together different generations. These four visits--a ballgame, commencement, funeral, and reunion--have reinforced some of my own impressions and opinions about my hometown and the people who live, work, and raise their families there. But it was the funeral procession that brought it all home to me. As we passed through town on our trip from the funeral home in Purcell to the graveside outside of Rosedale, people who didn't know who we were pulled over. No doubt some were in a hurry. Work was waiting. Things needed done. But for a few moments they pulled to the roadside and paused and paid respect to a family that was mourning, to a life that they didn't even know. Pickups and work trucks with places to go pulled aside in respect. A John Deere tractor in the field idled down and ceased its labor as the dust settled around it and the farmer bowed his head. I don't suppose I ever was so proud to be from Wayne as when I witnessed these simple acts of respect, dignity, and kindness in a world that too often never slows down, and when common courtesies are often ignored because of deadlines and the tyranny of the urgent. People from Wayne like to laugh and cheer. They love a good story and sometimes take too long telling it. Smiles are easy to come by. They have firm handshakes, and wave at strangers driving down the road. They are sometimes quick tempered but more often than not they're disposed to do the right thing. They don't speak the Queen's English but use contractions that make English teachers cringe, and use idioms that outsiders wouldn't understand. Wayne folk may shout too much but it's only because they're excited and proud of those they love. They may use quaint colloquialisms and idioms and end sentences with prepositions, but at least you'll know where they stand on an issue. Wayne folk aren't perfect, but never pretended to be. They're the kind of people who may not appreciate the chef's delicacies of caviar and champagne and dining el fresco. But they know how to be hospitable and appreciate a good cook. And they really do enjoy eating outside if there's good barbeque on the menu. People from Wayne are warm and friendly. They're the kind of folk who take their citizenship seriously, vote in every election, and who work hard whether their collar is blue or white, who put in a fair day's labor for a fair day's wage. They are people who volunteer and serve in the Armed Forces, who fought and died for our freedom, and who continue to put their lives on the line at home and abroad defending us. They are people who go to church on Sunday and who aren't afraid to pray out loud in the name of Jesus. They are the kind of people who when a funeral procession pulls through town, stop what they're doing to pull over in respect. I love Wayne and its humble, friendly, and decent citizens. Just saying...I'm glad to call Wayne, America my home town.